Heat oil in a wok. Add the onions and we stir-fry them until soft. Then add the lamb cubes and stir-fry until browned. Add the curry powder, the lemon rind, the tomatoes and the stock. Cover and let it cook over low heat for 1 and half hours. Stir occasionally. To complete this dish, add both the kumara and the coconut milk. Again, cover and let it cook for a further 20 minutes, until the lamb and the kumara are tender. This innovative recipe can be served with either rice or noodles. Comments: This unique & scrumptious curry made with lamb & AYAM™ coconut milk brings a whole new meaning to the word “flavor” & is loaded with protein, vitamins & minerals. It is packed with B complex vitamins that supplies energy by metabolizing the carbohydrates, proteins & fats, especially when we are under stress—either emotionally, physically, or mentally. Research studies indicate that low levels of B vitamins are risk factors for heart disease, neural tube defects, and colon and breast cancer. 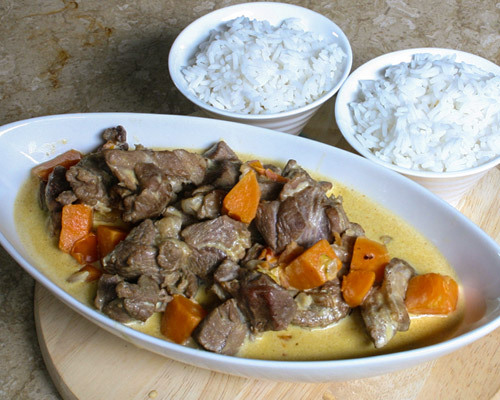 One serve of this curry supplies about 38% of our daily value of zinc, deficiency of which leads to hair loss, fatigue, skin problems, sleep disturbances etc.The saturated fat & cholesterol content comes from the lamb (whole) & this can be reduced by substituting it with lean portion of the lamb.